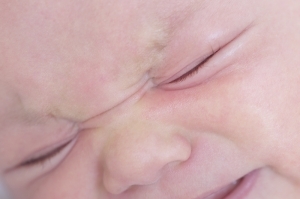 Understanding what the dire term colic is all about. You never thought it would happen to you. After 9 months of anticipation, your bundle of joy turns out to be a bundle of misery: a screaming, spitting, difficult-to-soothe baby who makes you wonder what you signed up for. Could the problem be colic? If you’ve got a screaming baby, you are not alone. Approximately one in four babies has protracted periods of screaming often referred to as “colic.” A term coined in 1954, colic was first used to describe any baby who just couldn’t settle down. But between 1954 and now, we’ve learned a lot about why babies do what they do. Since 1954, we have learned that many screaming babies once thought to have colic are suffering with treatable conditions like gastroesophagaeal reflux disease and a milk protein allergy. In my gastroenterology clinic, for example, over half of the babies referred for evaluation for colic suffer with one of these two conditions. Likewise, as a parent caring for a baby who can’t stop crying, it’s important to understand the basics of reflux and allergies so that you can advocate for your baby at visits to the doctor. What is gastroesophageal reflux? Plain and simple this is when stomach contents come up from the stomach into the swallowing tube and throat, causing pain. All babies have some reflux. However, not all babies are sick with reflux. Signs of acid reflux include frequent spitting up, painful arching from the bottle during feeds, chronic congestion, screaming after feeds and a preference for being upright most of the time. If reflux is severe, some babies may have a hard time gaining weight. Most babies with reflux can be treated with simple measures, such as when they are kept upright after feeds or they receive formula with rice cereal. For babies with significant irritability, poor growth or lung problems, medicines that suppress tummy acid like Prevacid or Zantac are often the first line of attack. While acid suppressants won’t stop reflux, they decrease the irritation that reflux brings. Irrespective of how sick or irritable a baby may be, the good news is that reflux is a short-lived problem. Most babies resolve their reflux between 4 and 12 months of age. But more than reflux can cause baby to scream. Some studies have shown that over half of miserable babies suffer with milk protein allergies. This happens when the protein found in milk reacts with the lining of a baby’s intestine and creates painful irritation. Symptoms include colicky, screaming behavior, mucus and streaks of blood in the stool, loose stools, spitting up and sometimes an eczema-like rash. For formula-fed babies, milk protein allergies are treated with the use of a hypoallergenic formula such as Nutramigen. For breastfed babies— babies can react to the protein in breast milk— removal of milk and soy protein is often enough to get a baby feeling better. Remember that it may take up to two to three weeks for a baby’s intestinal tract to heal after removing allergic proteins from the diet. As hard as it may seem, be patient. If you are paying attention, you will also remember that about half of the screaming babies I evaluate have got something treatable like reflux or an allergy. What about the other half? Great question. One thing that we often overlook is the fact that different babies have different temperaments. Some tots are easy going and some are high maintenance— a lot like adults. In other words, our expectations of a placid cherub who peacefully eats and sleeps may not be realistic. And when it comes to screaming babies, we’re always learning. An interesting study recently published found that a certain probiotic may play a role in the care of the screaming baby. Probiotics are live organisms that when ingested result in some sort of benefit to the person taking them. The particular probiotic, Lactobacillus reuteri (manufactured by Biogaia), was found to result in a significant decrease in crying when compared with standard colic drops. While it isn’t easy to explain why the reuteri babies cried less, it may be that the intestinal flora in a baby’s colon holds the key to health and, in this case, happiness. When you are seeking help for your screaming baby, be mindful that your child may be suffering with a treatable condition. Doctor visits are becoming shorter, and parents are becoming more involved in the diagnosis and treatment of their children. As a parent, you have to ask the right questions to ensure that you’re best advocating for your baby.